Indeed, I've been a stitching fool! My goal was to have samples done to decorate the Shoppe for fall. Mission accomplished! I've fallen in love with Stacy West's designs - Buttermilk Basin. She has such a sweet collection of primitive stitching designs. Ready? Oh, the centers are much darken than shown in the photograph. Gotta have that prim look! Last but note least - Halloween Blackwork! Thanks for stopping by! I still have lots to show you on the stitching frenzy front! Very, very cute! Love them all. These are terrific, each one; well done! I am truly inspired. You did a great job! They are so cute! 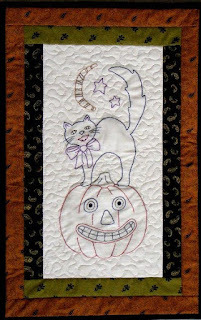 Great Halloween stitcheries....there must have been sparks flying off your needle! 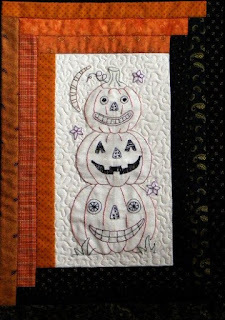 Halloween stitcheries. Great for decorating. I have one that I made but would like to make more. They look great - especially the Halloween one. Very cute. Are you having a big party this weekend for your upcoming birthday?